About the artist: In addition to scribal arts, Kara can be found helping to serve feast, participating in youth combat and archery or can be found anywhere there is a horse. Kara is a page for Sir Takamatsu. 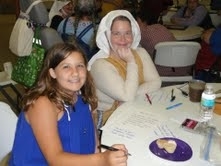 Interests: C&I, horses, youth combat, archery, horses, serving feast & waterbearing...did I mention horses?